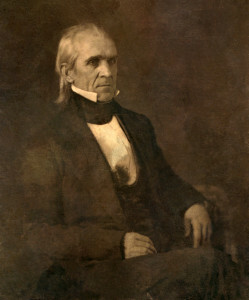 Polk was elected on the Democratic ticket in 1844 and served as president from 1845 to 1849. With the party torn among Martin Van Buren, Lewis Cass, and James Buchanan, Polk emerged as a compromise candidate. Because he was relatively obscure, he was referred to as a “dark horse.” During the Polk administration, Texas was annexed, and the United States fought the U.S.-Mexican War—referred to by those who opposed it as “Mr. Polk’s War.” As a result of victory in the war, the United States acquired the Southwest, including California.